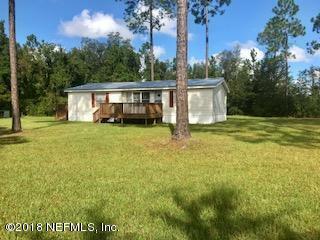 3 bedroom 2 bath mobile home with large front and side built on porches sitting on 1.76 acres Country living with a large yard. all bedrooms have a walk in closet, Master has sizeable attached bathroom with garden tub and walk in closet. Kitchen has plenty of cabinet space with a bar area also. Separate dinning area connected to the living room. Bring your toys, and animals to the quiet part of baker county!